When I started working in the field of UX and usability, the notion of “UX” was still a rather new thing. I often had to explain what it meant and why it was important. Now, 14 years later, the awareness of UX is much higher, but most UX professionals still spend a good amount of their time justifying why companies should spend time and money on UX. The question is simple: Does it pay to do UX work? It’s a fair question and forever relevant. It is also very easy to answer: “Yes, it does”. But it is much harder to calculate exactly how much the company will earn on each invested dollar in UX. 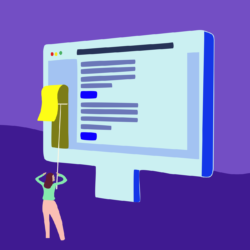 In this blog post, I will show how to calculate ROI for UX and discuss how it is best used by UX professionals to justify their work. ROI is about measuring the economic outcome of UX activities. And the first task is to figure out how too measure success for your specific project or application. Some of these are related to higher earnings, others are related to user behavior and times-saving for either the company or the end user. This means that if you are measuring a customer solution (for example a webshop), metric 1-4 are highly relevant. On the other hand, if you are measuring an internal system, metric 4-7 are relevant. In any case, all of the outcomes can be measured and be given an exact monetary value. So, how is this calculated? To get to the exact gain following the UX investment, you need to subtract the investment from the economic gain. But you should also take into account the years it will take to pay off the investment as well as inflation. 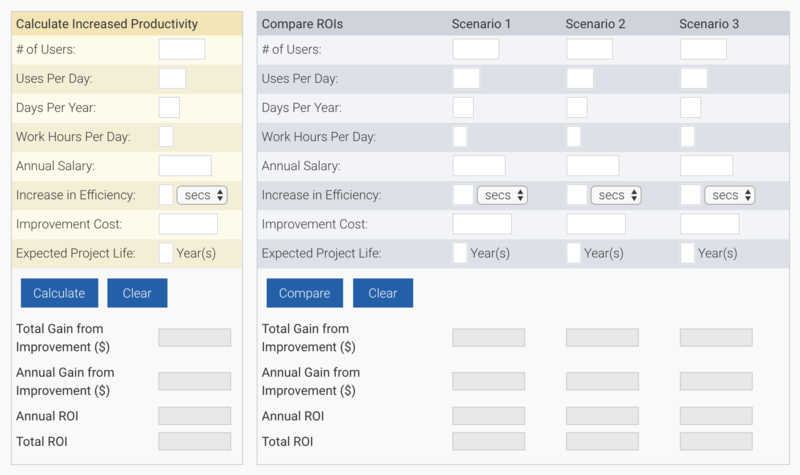 To calculate the ROI I will recommend to use the ROI calculators from Human Factors International: http://humanfactors.com/coolstuff/roi.asp. Here you can calculate how much money you earn from increasing productivity, conversion rate, decrease calls to help desk etc. Just pick the right calculator for your specific project. It is actually really fun to use the calculators, and seeing how much money you help the company save or earn can be rather satisfactory. Let’s do one here! I recently did a project with a client, where we redesigned the company’s internal service system that supports 700 end users employed in Customer service and Sales. The new system took content from 9 separate systems and made all the information available on one single page. This meant that the Customer Service employee could support the customer and get information from all 9 systems in just one glance at the screen, and dig into the data for more detail if necessary. The purpose of the new system was to save enduser time. The system was a big success, and the usability work we did with them was a big part of that success. But let’s see how much money this new system is saving for the client, using the calculator from HFI (picture to the right) that calculates gain from increased productivity. As you can see, I inserted the number of users, their work hours and average annual salary. This way I can figure out how much their time is worth. Then, by inserting an estimate of the saved time per use (20 sec.) I am able to calculate how much money is saved in total. From this amount the improvement costs are subtracted (including inflation). In this example, the result is a total gain from an improvement of $4,949,014. So, when is the ROI argument best used? When you think a UX problem is causing so much pain that it needs to be fixed: If the end-users need overlaps with the business aspect, ROI should be used to justify the UX work. And very often you’ll find there is money to be made fixing poor usability. When seeing new business opportunities when doing research: UX Researchers hear customer and end-users’ stories, needs and concerns. This can lead to new features that will improve the customer experience as well as earnings. Well, I am going to start using the business argument as a tool to be able to create better user experiences from now on. I hope you will too!